Even since the 1950s, the phrase "As seen on TV" has been the pitchman's mantra. For some reason, having appeared or been mentioned on television is supposed to bestow magical authentication and nearly mythical properties. In decades past, I was seen on TV...a lot. A bit on PBS ("The New Tech Times") and co-host of a weekly San Francisco Bay area live call-in computer show on an independent San Jose station. I can tell you from firsthand experience that appearing on TV does not guarantee stardom, fame, wealth, or, sadly, groupies clamoring for your bod. Some TV personalities have had all the right angles, the "It" factor, perseverance, chutzpah, or whatever to make it big on TV. Anything they say they like while on the air gets the green light to the Big Time. Oprah Winfrey is a goddess in this realm. Ya gotta hand it to her. As such an influential person, whether she's handing out cars or tears, her name on an endorsement is Solid Gold. And for actual paid endorsements, I'll bet she charges Solid Platinum. Spammers know the value of Oprah's name. They have abused her name for years and years. I've written about this before (here and here). But today I saw a spam message that upped the ante on Oprah abuse. 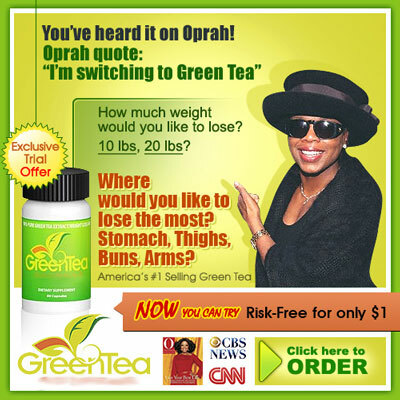 I am not a daily Oprah watcher, so I don't know whether she actually endorsed drinking green tea as a healthy or weight-reduction-inducing beverage. Even if she did, I doubt very strongly that she referred specifically to the potion described in the spam I received. There is a real picture of Oprah, although quite small, at the bottom of the ad (it's a cover of her magazine, along with additional suggestive broadcasting logos). I believe that smaller picture was inserted to suggest subliminally that the bigger picture is also Oprah—when it could be the marketing manager's momma for all I know. There's no way that a genuine endorsement would use a photo of Oprah covering so much of her face that she could hide her tells at a poker tournament. If someone can point me to a genuine source of the larger image attributing it to the real Oprah, I'll gladly retract my statements. In the meantime, if I were the spammer sending out this message, I'd keep an eye out for a letter from Oprah's people. Unlike most spam that relies on unsubstantiated assertions (aka misleading suggestions), this one appears to be CAN-SPAM compliant, complete with the identity of the sender in the same state as Oprah's operations. You can't possibly want to mess with Oprah. I continue to dream that Oprah will use the platform of her TV show to educate her audience—I believe among the ones most susceptible to the tricks of spammers and scammers—how to recognize a scam when they see one. I could help her muster quite an army of scam-fighting computer users who typically don't visit the security-related web sites that we spam-watchers do. There is a huge audience out there that needs to get the message now. Notice that I intentionally obscured part of the spammed product's name and logo. I don't want the spammer to start a new campaign blaring: "As seen on spamwars.com!"